Looking for something fun and different for your childs birthday party or other Children’s party? For more information on Martial Arts or Dance themed kids parties call Neal on 07912867687! 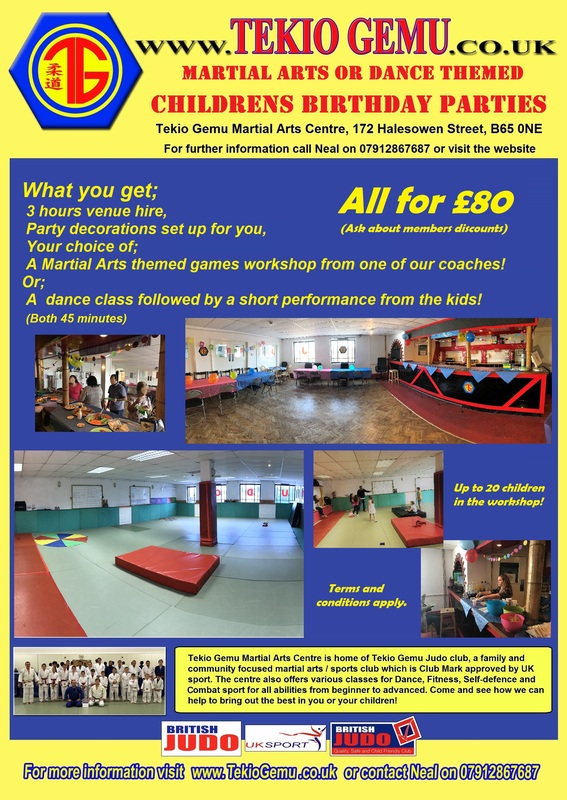 Hire Tekio Gemu Martial Arts Centre for your Child’s party – Only £80 for 3 hours including a 45 minute activity and decorations set up in advance! Childrens Birthday Party venue for hire at 172 Halesowen Street, B65 0NE. Convienietly close to Halesowen, Blackheath, Rowley Regis and Cradley heath. The hall can be hired seperatly for an hourly rate. Please call for details.